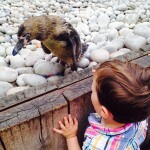 This was my first ever trip to London Zoo. I’m not quite sure how that happened. Over the years I have jogged around it, taken the bus past it, even sailed through it on the canal. You can glimpse fascinating peeks of some of the zoo’s residents from these various vantage points and yet I had never made it through the turnstiles. 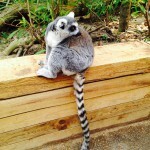 Now the boys were old enough to appreciate the zoo’s inhabitants, I finally had the perfect excuse for my maiden visit. On this occasion, MJ was at nursery and so G and I were on our own. On arrival at the Zoo, the first thing we spotted was Penguin Beach. This was a good place to start as it was deserted and so we got right up against the tank and followed the penguins swimming back and forth. Next we walked through the butterfly tent, spotted a statue of the bear that inspired Winnie-The-Pooh, had a look at the flamingos and took a detour into the play area. We didn’t come to the Zoo just to play on the slide so I managed to entice G away with the promise of tigers. As we entered the enclosure, the stunning male tiger walked straight past us and we managed to spot some female tigers from the elevated viewing platform. I was impressed by the layout of the enclosure, which lets you view the animals from lots of different angles, so you can spot them even when they are hiding. 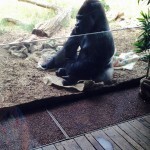 The gorilla enclosure was also fun, with mist sprays and jungle birds setting the scene on the way in. The tiny baby gorilla cuddling its mum was probably the highlight of G’s day. We saw giant tortoises, monkeys, reptiles, vultures, giraffes, pygmy hippos, zebras, kangaroos, emus and all manner of sea life in the aquarium. The lemur walk is particularly fun as the lemurs are lounging around amongst the visiting public and there is an indoor rainforest experience (warning: very hot and humid) where you can see monkeys, a sloth and more. G’s batteries ran out and he fell asleep in the pushchair before we managed to see everything. If you have the time and the energy there are talks and feeding sessions all day long all over the zoo, plus farm animals and a spider walk-through that we just couldn’t squeeze in. Not to worry, we’re very glad to have an just gives us excuse for a return trip. This may have been my first trip to the zoo, I don’t think it will be too long before we go back. 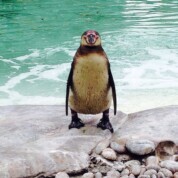 Entry to ZSL London Zoo costs £22.50 for adults, £16.65 for children, under 3s enter free. We did not have to pay the admission cost on this occasion. 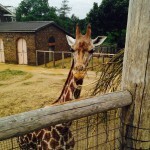 ZSL London Zoo is open 10am to 6pm seven days a week. Closed on Christmas Day. The Zoo closes earlier in the winter, check the website for details. There is a restaurant serving hot and cold meals, and various cafes and kiosks selling light refreshments and ice creams. As a guide a cappuccino costs £2.75. There are picnic areas for you to bring your own lunch. There are plenty of baby changing facilities around the Zoo. The Zoo is accessible to pushchairs. By train: the closest stations are Camden Town (Northern Line, 15 minutes’ walk), Baker Street (Jubilee, Metropolitan, Circle, Hammersmith & City, Bakerloo lines – 30 minutes’ walk, take the bus! ), Regent’s Park (Bakerloo line, 20 minutes’ walk). By bus: the 274 stops outside the Zoo. You can take the 274 from Baker Street station.